I just posted a video on an easy technique for putting your cover on the rpod. I posted this tip with stick drawing animation last year. The video shows the technique. Thanks for posting the video. A picture is worth a thousand words! Life is good in R-Pod! What do you attach the poles to the cover with. Also how tall are you and how long are your poles. I'm 6 foot even and my wife is 5, 7. The poles are 6 foot fiberglass paint extension poles from Home Depot. The pole handle ends have eyelets. I use disposable nylon cable ties to attach the pole to the cover eyelets. The cover happens to have brass eyelets at the four corners. It's easy to connect the cover and poles that way. After I'm done I just snip the cable ties off. I use small bungee cords to attach the eyelets at the rPod end to the stabilizer jacks. I tried using the metal poles that came with our rDome, but they are too weak and I ended up bending one of them. The hardest part is getting the cover to "jump" the roof hardware. You just have to jiggle it and make sure that the cover is not caught on the propane tank in front. A third person to make sure the front end flows easily would be a help, but not neccessary. Ok that helps, and why it hasn't worked for me. You have at least 10" on me and your wife has 14" on Myra. I have two bamboo walking sticks that are very strong, we just don't have the height. I have a plan or a mini innvention for the vertically challeged, if it works I post it after memorial day roundup. Maybe I can get someone to video it for us. we just don't have the height. My hot tub cover has an "upside down U" shaped pipe device that lets me open and close the hot tub cover with ease. Perhaps a PVC device similar but larger in scale would work for a cover. You would need to anchor it midway on the pod with a hinge that allows 180 degree swing. Unfortunately, I'm short (5'2") and Myra is Shorter (4'10") and we both don't have the upper body strength for longer pole. Here is a short person(s) How to Place a rpod Cover. First of all I've put 4 grommet holes along the back, one about an inch from the corner seem and one on either side of the center back seem. I used a piece of 3/4 PVC (76" long) and drill small holes corresponding to those in the cover. With pieces of cord I attach the pipe to the cover. Than I use a long piece of nylon rope tied at both ends and in the middle to create a triangle. To the end of the nylon rope I have a large dog toy ball attached. I throw ball over Podterfly. Myra pulls the rope down and the cover lifts. Sometimes we get a little help from the wind and the cover because a kite, another wise I use a walking stick to get over the snags. Total unhitch and cover for storage last trip. 45Minutes. 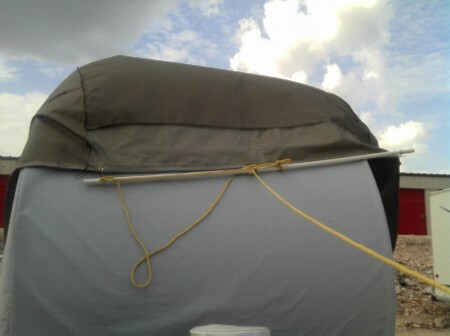 When is storage the Pole stays attached to the cover, when traveling the pole fits with my rdome poles. Lee - We also use those same dog toys (looks like a tennis ball) on our pod cover. But we use 5 of them without the PVC pipe. 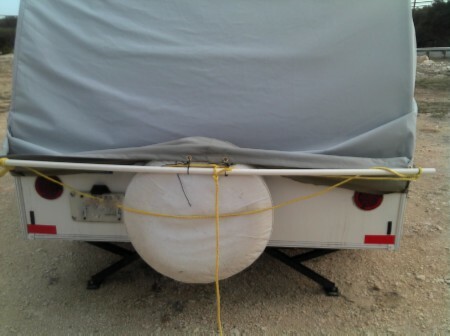 We have 1 ball and rope attached to the middle point of the cover in the rear. 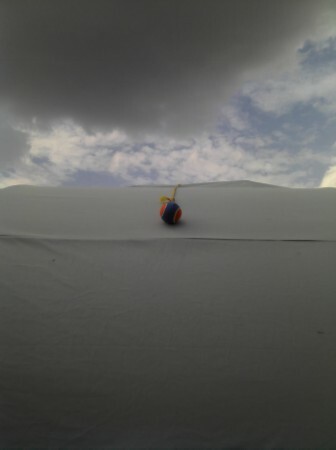 The other 4 balls are attched with ropes to the side grommets of the cover (2 on each side). 1. One of us stands at the front of the pod with the cover and throws the ball/rope that's attached to the rear of the cover over the top of the pod to the person who's standing at the rear of the pod. 2. 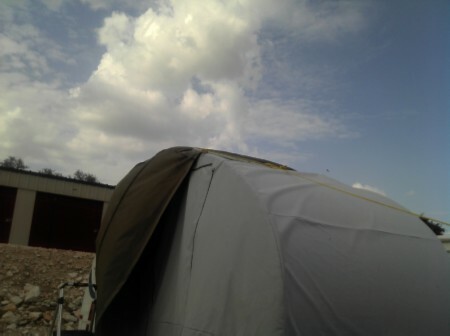 Person at the rear pulls the rope to get the cover up on the roof while the person at the front makes sure the side balls/ropes are free to dangle over the sides of the pod as the cover goes up. 3. Once the cover is up and on the pod, we go to opposite sides of the pod and pull the side ropes to bring the sides of the cover down. Like I said, this is completely untested but I'll report back what happens when we give it a try.